Maybe it's just me, but staring longingly at the gardens of that French chateau this week made me long for gardening supplies & countryside chic decor. Whenever that feeling hits, I find myself on Terrain, an online site for all things garden-related and chock full of sweetly rustic, country-inspired decor. They carry a little bit of everything, from terrariums (perfect for adding a little green indoors!) to table settings to unique jewelry. High on my *lust list* is that cast bronze leaf coffee table-the perfect understated statement piece for any room. I'm also longing to pick up the vintage textile tote for weekends at the Brooklyn Flea & occasional farmer's market! Most of the items on Terrain would make an excellent gift for a housewarming or birthday, too. Who doesn't love getting a great candle, touch of greenery or interesting decor piece? 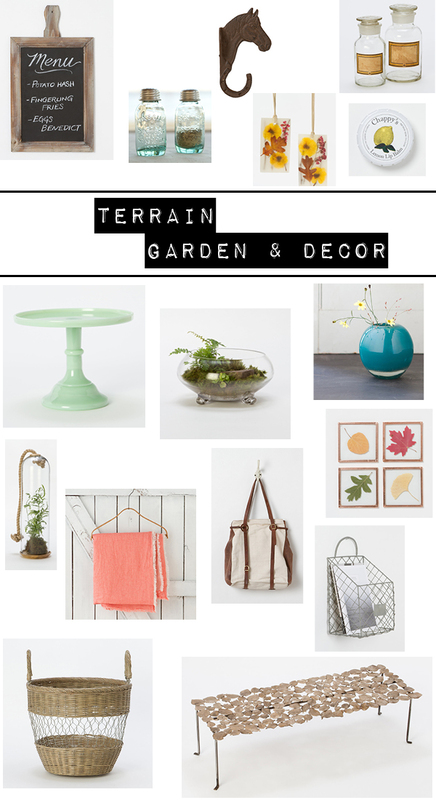 I've never heard of terrain before, but I love that country chic style. Thanks for sharing! I am obsessed with Terrain! I am lucky enough to have the store right down the street from me, so I go there often to the cafe for tea and to peruse the store. Such amazing interior/garden style. They also have an amazing restaurant. Didn't even realize they have brick-and-mortar stores-so exciting (and I'm a little jealous)! !